While the Iran regime has been working hard to portray itself as a peace-loving group of mullahs only interested in the peaceful splitting of the atom, drama was playing out on the high seas as Iran engaged in a high-stakes poker game with the U.S. Navy and commercial fishing vessels much to the consternation of the regime’s lobbying and PR allies who had to answer some uncomfortable questions. It began last week with the decision by the mullahs to send a nine-ship convoy steaming towards Yemen with what was believed to be a large cache of supplies and weapons for Houthis rebels they had been backing in the overthrow of Yemen’s government. This was followed by the decision to send in the U.S. nuclear-powered aircraft carrier Theodore Roosevelt with escorts into the Gulf of Aden to deter and possibly detain the Iranian flotilla, which eventually turned back to Iranian waters. Then this week saw an act bordering on piracy when Iranian navy ships fired across the bow of a Marshall Island-flagged container ship steaming through the Straits of Hormuz. After the ship refused to turn towards Iranian waters, it was boarded and the 24-man crew detained and the ship confiscated over a reported legal dispute. 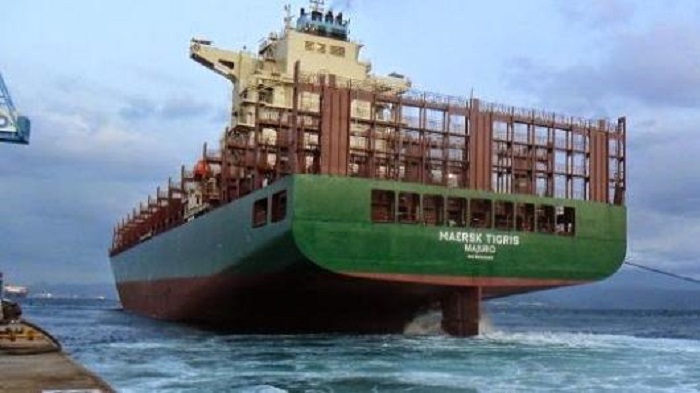 Earlier reports indicated the Iranian navy ships had reportedly been on the lookout for a U.S.-flagged commercial ship and mistakenly stopped the Maersk Tigris. The U.S. and Marshall Islands share a defense treaty and it remains to be seen if the boarding of the vessel would trigger the security agreement. The rapid escalation in provocative moves by the regime in international waters has posed a sticky problem for regime supporters, even Congressional supporters of a nuclear agreement with Iran were at a loss of explanation for the actions. “We have to assure the sea lanes are open. I think it’s important to find out exactly what happened,” said Sen. Jack Reed (D-R.I.), the Armed Services Committee’s ranking Democratic member. “But we can’t tolerate interference with vessels moving up and down in international waters. It’s very serious when ships are intercepted like that,” he said. In response, the U.S. Navy instituted a new policy of escorting commercial ships through the Persian Gulf and monitor for any distress signals sent out from vessels traversing the Straits of Hormuz in clear warning to the mullah’s regime in Iran. Reza Marashi, who has entitled himself as “research director” of the regime’s chief lobbying group the National Iranian American Council, offered the ludicrous notion that Iran may have boarded the ship because of suspicions it was from rival Saudi Arabia and heading to the United Arab Emirates. “If that’s true, it could be part of an escalation in the conflict between Tehran and Riyadh,” Marashi said. One theory he offered was that the Iranians could be retaliating for the Saudi bombing of a landing strip in Yemen where Iran was said to be planning to land a plane. Marashi probably would have also offered as explanation that Mercury was in retrograde or aliens had seized control of the Iranian navy commander’s brain since those excuses made as much sense for the regime’s blatant disregard for international maritime law. All of which poses a pickle for supporters such as the NIAC who have long argued that the Iran regime could be a trustworthy and believable partner in an international nuclear agreement, but is now faced with yet another inconvenient example of Iran’s mullahs flouting the law. The near constant displays of disregard for agreements, treaties and law by Iran’s mullahs should not catch anyone unawares and only reinforces the growing perception in America that any agreement Iran signs will not be worth the paper it’s printed on.